VE3SRE.COM - Amateur Radio, GNU/Linux & Free Software, Streaming Audio and whatever else!VE3SRE.COM | Amateur Radio, GNU/Linux & Free Software, Streaming Audio and whatever else! This site has been much neglected! It’s been about four years since I’ve posted anything here and there’s been a lot of water under the bridge. But, as a followup on my last post, I can report that after four years, I’m still using Ubuntu MATE as my daily driver GNU/Linux distro. I’m still using the same i5 laptop as my main machine, but, over the last few years I’ve bumped up the RAM to 8 gigabytes and I’ve swapped out the hard drive for a 500 GB drive. I’m now running Ubuntu 18.04 LTS as well. What can I say, it just works! I’ve got access to the extensive Ubuntu software repositories, and if something is missing or not up-to-date I can just add a PPA. And, now there are the new kids on the block, “Snap” packages and “Flatpaks“. Many of you who are currently running Windows 7 will hit the “end of life” wall in January, 2020. After that, you’ll have to switch to Windows 10 if you want to stay in the Microsoft world. But, you might not be running hardware that will handle it. Certainly I wouldn’t want to touch Windows 10 with anything less than 8 GB RAM and 16 GB would be better. I honestly don’t care what the folks at Microsoft tell you. Lucky for me I’ve only had to deal with Windows 10 on other people’s machines and quite frankly, it’s a mess of ads and other crapware constantly popping up at you. When you first set it up you’ll spend at least an hour shutting crap down and turning stuff off. So, if you’ve got some kind of early vintage 64 bit computer with two to four gigabytes of RAM, I’d seriously take a look at Ubuntu MATE. It could mean the difference between buying a newer computer and keeping you’re old computer running! I came across this “Number 19 Set” up for sale at “Hamex“, the annual amateur radio fleamarket sponsored by the Mississauga and Peel Amateur Radio clubs held every March at the Brampton Fairgrounds. This particular radio has an interesting history. The original version of the 19 Set was used by the British Army during the Second World War. The version seen in this photo was produced here in Canada by Northern Electric sometime after 1942. You’ll note that the radio is labeled in both English and Russian. That’s because these radios were also supplied to the Soviet Red Army for use on the Eastern Front. 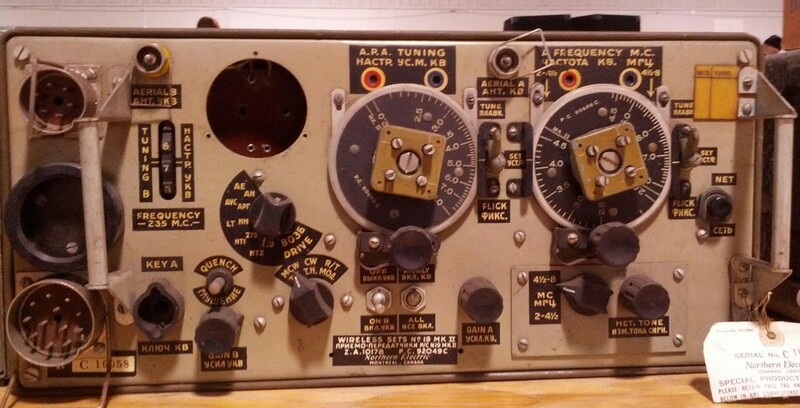 Nowadays you’ll find folks in the amateur radio community who restore them for use on the amateur radio bands! Did I buy it? No but I did take this photo! And a photo is worth about 150 words on a blog post. I’ve never met Norman Rashleigh VE3LC, a long time Ottawa area ham radio operator. But I have to give him a big public thank you and I think it’s overdue! A couple of years ago the kitchen in our early 1920’s vintage house underwent a major renovation. That meant changes to the electrical layout to handle all the kitchen gizmos in a 21st century Canadian kitchen, along with a switch to more energy efficient lighting. For anyone with an interest in radio communications, energy efficient lighting is often a bit of a two edged sword. You certainly do save money on your electricity bill, but it often comes at the cost of massive radio frequency spectrum pollution. It doesn’t need to be this way of course, but it’s the result of the deregulation of industy over the last few decades and electronics manufacturers being allowed to “police themselves” on RF spectrum pollution issues and near zero enforcement by government agencies around the world. Throw into the mix, the shift to ever cheaper electronics products made by folks in parts of the world where people don’t get paid very much and couple that with the use of cheap electronic components and no effort to do any kind of RF shielding or filtering. In house renovations, more thought goes into what a light fixture looks like than anything else. As a licensed amateur radio operator, I was quite concerned about RF pollution. Living in a large urban area, I didn’t expect the RF pollution situation to be perfect, but I wanted to minimize it as much as possible. So with the kitchen renovation job just about wrapped up, I went into the kitchen and turned on all of the lights. They generally looked pretty nice. Then I took a little Sony portable radio into the kitchen and turned it on to the AM radio band. Even radio signals from local 50,000 watt radio stations were completely wiped out by a loud buzzing noise. So, if these light fixtures wiped out the entire AM radio band what was going to happen to my ham radio equipment? I went through the lighting system turning stuff on and off so that I could narrow down which lights were causing the problem. I eventually narrowed it down to a string of lights that were above the kitchen sink. While I was doing that, a ham radio buddy of mine dropped in and told me “hey, I read something about that in QST”. We looked it up online and found the problem. That lead me to this little Youtube video about Eurofase halogen lighting posted by Norm VE3LC that I’m linking to below. A word of warning, before you view this video you’ll want to have your fingers near your speaker volume controls to turn down the really awful noise generated by these Eurofase lights. I showed Norm’s video to my kitchen contractor and told him in no uncertain terms that I wanted this Eurofase lighting removed. So they removed it and replaced it with something that appears to be reasonably RF quiet. So Norm, I’d like to say thank you! To Eurofase, you’re producing crap and I’ll never buy anything with your brand name on it. Along with the MP3 streams, BBC Radio streams are also available in the AAC format. I’ve found out or figured out the URL’s for some stations (a bit of trial and error involved) and I’ll post these after I’ve made a little more progress. There are two AAC streams available. One is a high quality stream available only to folks in the UK (the rest of the world is blocked). The other lower quality AAC stream is available for folks in the rest of the world.